The Organization for Economic Co-operation and Development (OECD) has reported that official development assistance (ODA) for 2015 has decreased to the least developed countries, and as a percent of the Gross National Income of the donor states. Check especially the last chart in this OECD press release — also note that in many cases these data are strongly influenced by forgiveness of foreign debt, which does not represent funds available for new investment in development. 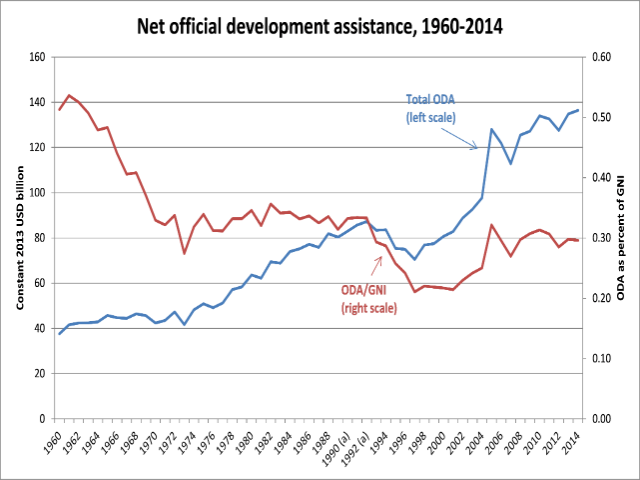 In 2014, final figures for net official development assistance (ODA) flows from DAC member countries totalled USD 137.2 billion, marking an increase of 1.2% in real terms over 2013 and surpassing the all-time high in 2013. As a share of GNI, ODA was 0.30%. Preliminary ODA figures for 2014, published in April 2015, indicated a slight decline (0.5%) in total net ODA compared to 2013 (see http://www.oecd.org/dac/stats/development-aid-stable-in-2014-but-flows-to-poorest-countries-still-falling.htm), but this decline was reversed in the final data, as several members reported slightly higher volumes of aid for certain items (e.g. Italy reported about USD 600 million more in its final data, mostly for in-donor refugee costs). In the past 15 years, net ODA has been rising steadily and has increased by nearly 70% since 2000. The largest DAC donor countries by volume were the United States, the United Kingdom, Germany, France and Japan. 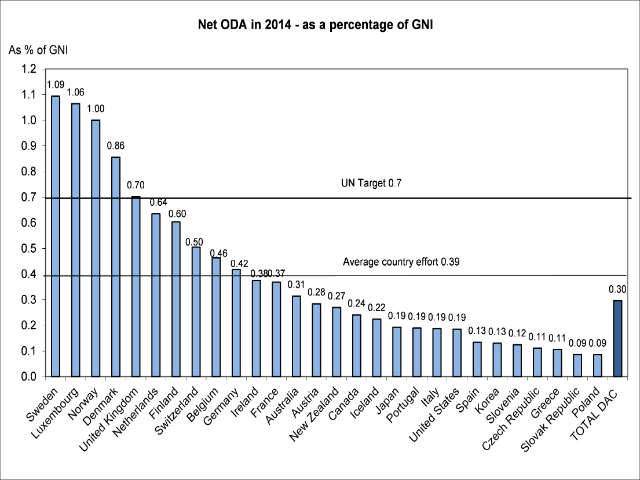 Denmark, Luxembourg, Norway, Sweden and the United Kingdom continued to exceed the United Nations’ ODA target of 0.7% of GNI. 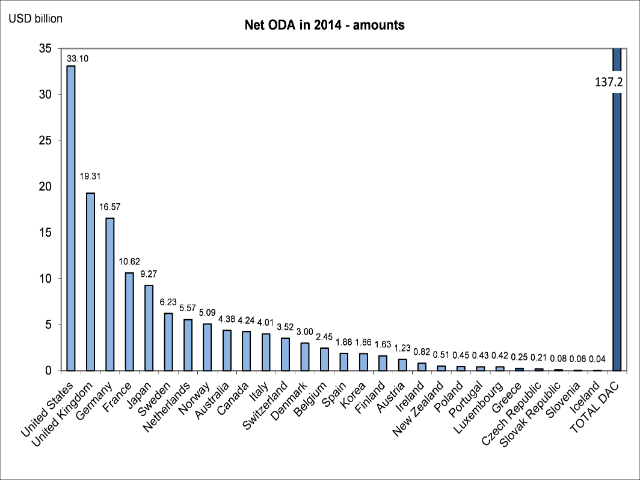 G7 countries provided 71% of total net DAC ODA in 2014, and the DAC-EU countries 55%. Net ODA disbursements by EU Institutions were USD 16.5 billion. The largest recipient of total net ODA in 2014 was Afghanistan, which received USD 4.8 billion. Viet Nam and the Syrian Arab Republic were the next largest recipients receiving USD 4.2 billion each, followed by Pakistan, Ethiopia (USD 3.6 billion each), Egypt (USD 3.5 billion) and Turkey (USD 3.4 billion). Total net ODA allocations to the Middle East region (i.e. amounts unspecified by recipient country) amounted to USD 12.3 billion. Total ODA to the group of least developed countries was USD 43.7 billion, a decrease of 9.3% in real terms compared to 2013. Much of this was the result of lower levels of debt relief, which was relatively high in 2013 due to assistance to Myanmar. Excluding debt relief grants, ODA to the least developed countries fell by about 4.6%. Total ODA to sub-Saharan Africa was USD 44.3 billion, a decrease of 4.4% in real terms from 2013. Excluding debt relief, the decrease was 2.7%. This entry was posted in Development, Governance and tagged OECD. Bookmark the permalink.